I have updated the model portfolio this morning. This entry was posted in Uncategorized on July 29, 2011 by Gary. The persistent and mindless bullishness on gold lately has got me nervous. When I get nervous the first thing I do is pull up a multi-year chart and look at the big picture. A couple of things are apparent when one looks at the chart below. First as I’ve noted many times in the past gold has a tendency to move above a big round number before topping. It did it at $1025, $1225, $1432, and gold recently tagged $1630. 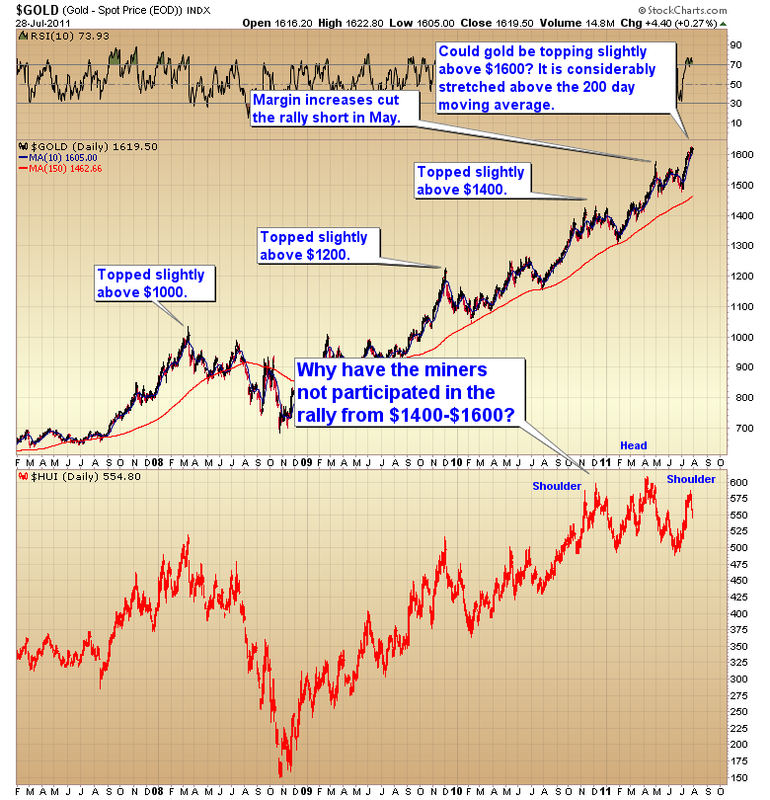 Another glaring discrepancy in that chart is the utter failure of the miners to participate in the last 200 point rally in gold. As a matter of fact the miners could possibly be forming a head and shoulders top. We can also add to this the fact that sentiment has reached levels that in the past have triggered intermediate declines. Plus gold is now stretched above the 200 day moving average. Now I don’t want anybody to think that I have all of a sudden become bearish on gold, I haven’t. Gold is quite obviously in a secular bull market. I am however beginning to question whether or not the low we saw three weeks ago was an intermediate bottom. I have been riding this bull market long enough to know that when everyone is rabidly bullish (especially me) it’s about time for gold to throw a curveball. Until the dollar breaks below the May bottom I think we need to be very careful in assuming that gold is going straight up. I have updated stops for mining positions. This entry was posted in Uncategorized on July 27, 2011 by Gary. In the chart below I have marked the final phase of several gold C-waves. These highly speculative periods tend to end as a parabolic blowoff rally with gold stretched quite far above the 200 day moving average. The final phase of a C wave rally also tends to correspond with another leg down in the Dow:gold ratio. After an extended two year consolidation I think we are now due for that final explosive move that should drive the next repricing of stocks against gold. 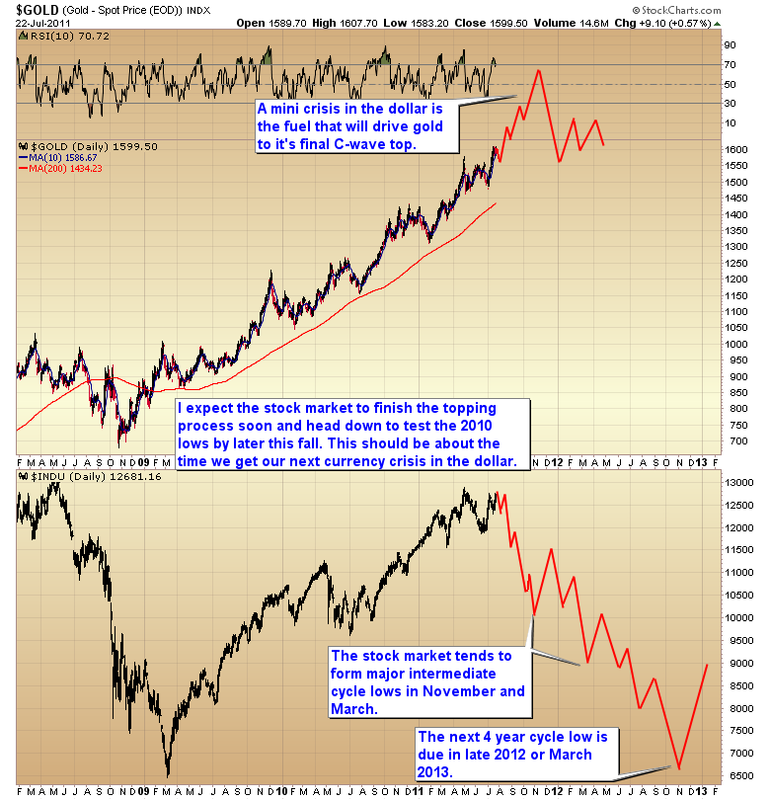 I expect we will see a combination of gold rallying wildly higher while stocks rollover into the next cyclical bear market. I’m looking for a Dow:gold ratio somewhere around 6 to 1 later this fall. If gold rallies to $1800 (my best guess) then we can look for the Dow to drop down around 10,000. As many of you may have noticed stocks tend to put in major intermediate lows in November and March. The dollar often forms it’s yearly cycle low in November. If the dollars three-year cycle bottom is still ahead of us, and it’s starting to appear that it is, then the currency crisis that we avoided in May should come in late October or November this year. That currency crisis should drive the final parabolic C-wave move in gold and the first major leg down in the stock market. We should then see a relief rally in stocks as the dollar crisis comes to an end and gold will enter a severe D-wave, regression to the mean, profit-taking event. The relief rally in stocks unfortunately will be short-lived. With no true productivity to drive it the stock market is not going to be able to fight a rising dollar. Now that the last true period of productivity has ended (the personal computer and Internet boom) the only way stocks can resist the forces of the secular bear is through expansion of the money supply. 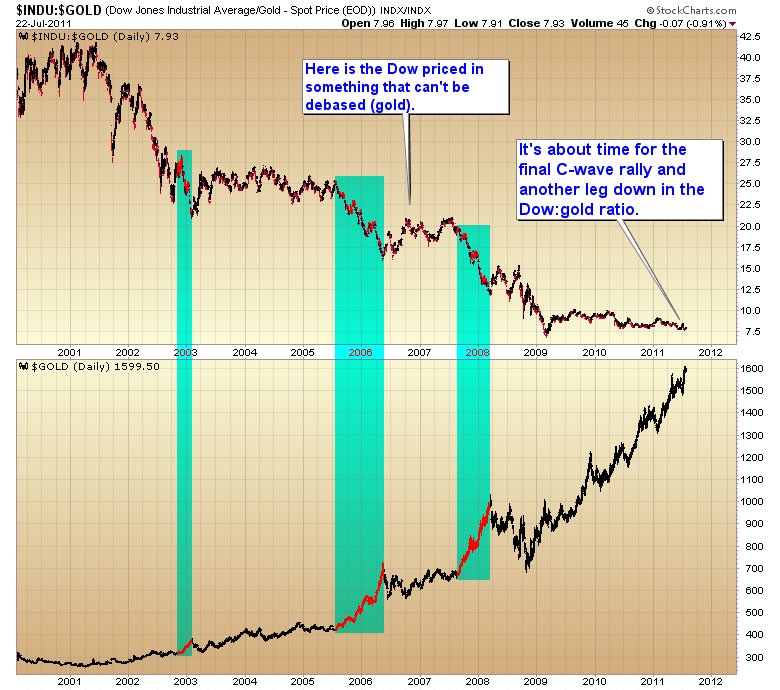 That becomes painfully obvious when one looks at a 10 year chart of the Dow priced in gold. The problem of course is that printing money is not true productivity. Printing money has consequences, as we found out in 2008. It won’t be long before we begin to suffer the consequences of Bernanke churning out trillions of dollars to save the financial system. But who’s gonna save us from Bernanke! This entry was posted in Uncategorized on July 25, 2011 by Gary. I often keep tabs on the weekly Chakin money flow indicator, especially when I’m expecting an intermediate degree correction. More often than not there will be a divergence in money flow at intermediate tops as smart money exits ahead of a correction. This indicator also diverged at the last two bull market tops. 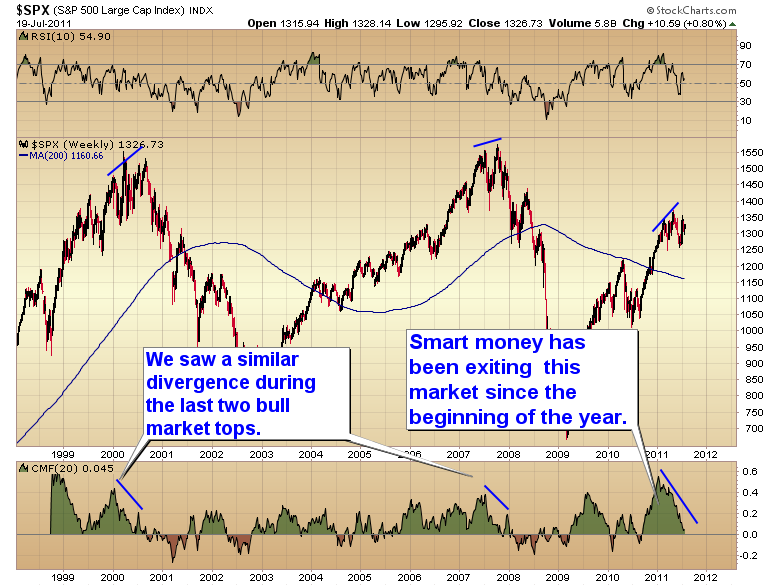 It is now showing a huge divergence that I think is probably indicative of a third cyclical bull market top forming. This entry was posted in Uncategorized on July 20, 2011 by Gary. The tournament this weekend was a big success. Two of our lifters made it onto the winners platform. Our lightweight took the bronze medal and our superheavyweight took the gold. 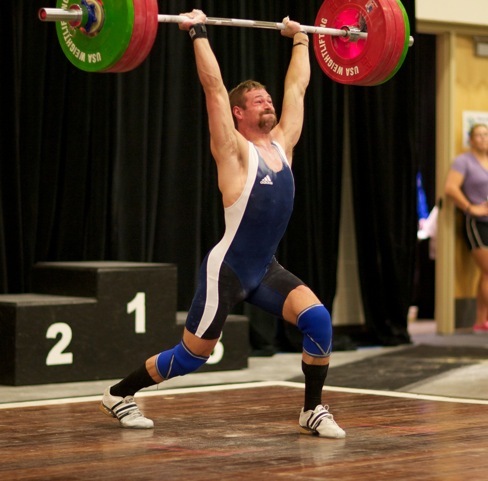 Considering this was their first national championship that was some pretty strong lifting. This entry was posted in Uncategorized on July 18, 2011 by Gary. A portfolio change as been added to the website. This entry was posted in Uncategorized on July 13, 2011 by Gary. This entry was posted in Uncategorized on July 12, 2011 by Gary. I have updated the stops and trade triggers link on the website. This entry was posted in Uncategorized on July 11, 2011 by Gary. As many of you know I believe that we have begun the topping process of this cyclical bull market. In a healthy market an intermediate decline is a profit-taking event after a significant leg up. It should hold well above the prior intermediate bottom. 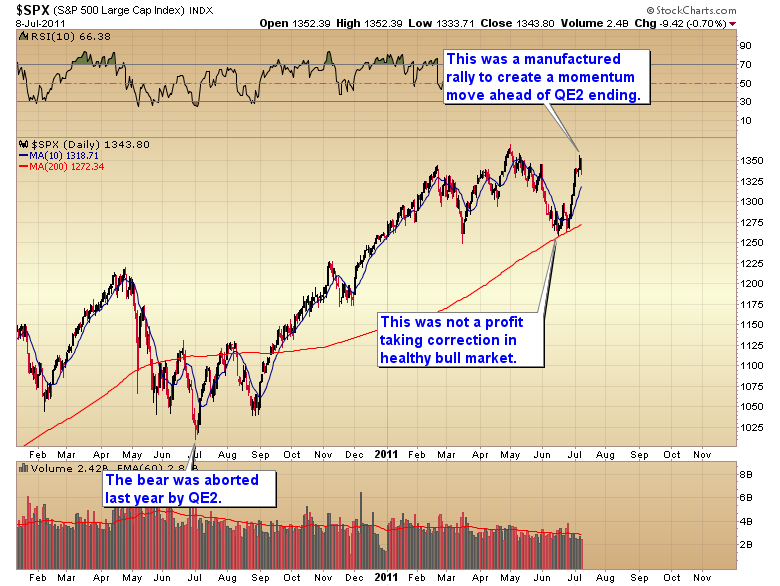 The decline into the June low was not a profit-taking event. The market had not rallied long enough or far enough to warrant an intermediate correction and certainly not one that would test the March lows. The decline in May and June was the first shot over the bow that something is wrong with the fundamentals driving this market. Now let me be clear because I think many people got the wrong idea from my last article. I don’t recommend anyone sell short the market. All I’m saying is it is too late to have retirement funds positioned long at this time. Asset appreciation is the Feds stated third mandate. Bernanke is going to fight the bear tooth and nail. There will be continued interventions into the markets. The rules will be changed as we go. Anything and everything will be tried to keep stock and bond markets levitated. 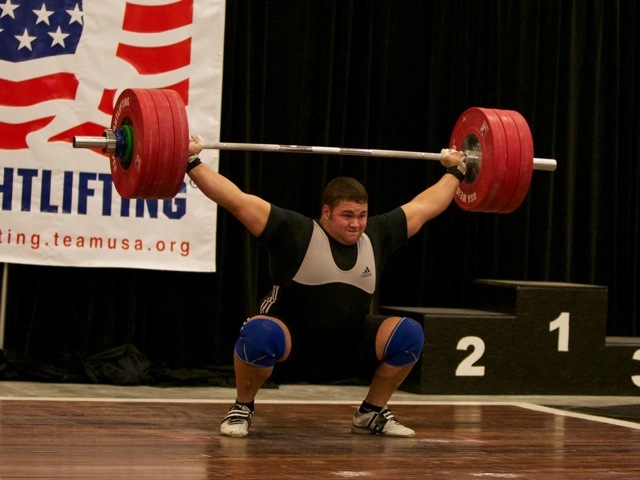 That is not the kind of environment conducive to making consistent gains on the short side. That is the kind of environment that can and will whipsaw traders to death. Even in a market free of intervention the topping process is always volatile and dangerous. But in a market that is being actively managed it is especially dangerous on the short side. Case in point. The June bottom was way too early for a final intermediate bottom. As I said in my previous articles we should have seen a counter trend bounce to relieve sentiment extremes followed by another leg down into a more lasting bottom. Unfortunately that was not allowed to happen. The powers that be manufactured an explosive rally on the low volume preholiday week in the attempt to create a massive momentum move ahead of the end of QE2 that would be hard to turn around. Needless to say Bernanke didn’t want a repeat of last year when QE1 ended. The Fed can temporarily turn the markets higher but what they can’t do is reverse the economy. I said when QE1 began that no amount of printing or stimulus would stop the underlying cancer in the economy. All it would do would be to create a brief reprieve which would be followed by an even deeper and more severe recession once the sugar high wore off. The simple fact is that we cannot cure a problem of too much borrowing and too much spending with more borrowing and more spending. We tried this in the 30’s and it caused a 15 year depression. Japan tried it and it led to two lost decades. The cure is to bite the bullet and allow the deleveraging process to run its course. Yes it will be painful. We’ve put this off for so long that it isn’t just going to be painful it’s going to be catastrophic. But the longer we kick the can down the road the worse the endgame becomes.The only ray of sunshine I can offer is that if we let the markets work they will complete the deleveraging process fairly quickly. Within 2 to 3 years the world can be back on a sustainable path of growth. Continue to fight this and we could be stuck in an on-again off-again recession for another 20 years with the final end game collapse so devastating that it will make the Great Depression look like a picnic. The last two employment reports are clearly showing that the economy is slipping back into recession. I suspect by August the employment report could, and probably will, turn negative. All the manufactured rallies in the world cannot prop up the stock market if the economy is rolling over into another recession. They can postpone the inevitable only so long and ultimately it will just make the bear that much more severe. The Fed’s efforts have only extended the topping process they haven’t stopped it. This entry was posted in Uncategorized on July 9, 2011 by Gary.